Natron Cutoff, Milepost 561, June 24, 1971. SP8954 and her partner are straining on the dynamics to hold back following TOFC from California. Back up the train, a trio of SD45’s are helping her fight the law of gravity! She'll pass us, duck through one more tunnel, crossing over Salt Creek and US 58 dropping down into Oakridge, Oregon. From there, a pleasing down slope run through Oakridge, Springfield, taking a breather in Eugene. 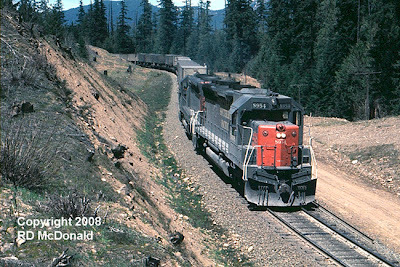 In 1926, the Southern Pacific completed its north – south trek over the Cascade Mountains -Willamette Pass - connecting Natron, Lane County, Oregon, with Black Butte, Siskiyou County, California. This route shortened, by 25 miles, the run from Eugene to Sacramento, compared to the Siskiyou Line, which, by the way, was the scene of the last great armed train robbery in the USA. But that’s something you can look up in Google. A fellow by the name of Joel Ashcroft, who works for the railroad, has placed a very complete, competent and easy read history of the Natron Cutoff, including a detailed strip maps, construction photos, cab photos, and profiles. Under "Structures," a photographic tour of the Natron Cutoff, that takes you over the entire landscape. For those of you who have the computer horsepower to run “Google Earth,” enter “Oakridge, Oregon” in the search engine. Zoom in until you can make out the railroad grade, and follow it over its magnificent landscape to the Cascade Summit. The Historic American Buildings Survey/Historic American Engineering Record details the entire route, and is a fascinating historical record of the Natron Cutoff. While the Saluda Grade is steep and the “darling of east coast railroaders,” the fact is it is only three miles long, and “peaks out” at all of 600 feet and inches! However, the Natron Cutoff is at least four times as long, with two massive horseshoe curves, more than a dozen tunnels and snow sheds, peaking out at almost five time the elevation at 4, 885 feet elevation and the trains still have to get over Grass Lake summit south of Klamath Falls near Black Butte, at 5,122 feet elevation, before rejoining the Siskiyou Line main to Sacramento. Ruling grade north bound is 2.2%; 1.8% south bound. As you view the Grass Lake virtual panorama, when you scan to point where you can see Mt. Shasta in the background, in the foreground you can see the SP rail alignment, just behind the truck trailer, at 5,122 feet elevation, almost a mile high! Railroad Stuff. SP 8954, EMD SD45, 645E3 V-20 motor rated at 3,600, built 1968.